Apps are on everyone’s mind at this year’s CES and Ford is no different. The Detroit car giant paired up with INRIX, a leading provider of traffic information, to create a new version of their SYNC Destinations app. The SYNC Destinations app is a free mobile app that was released for free on Android and iOS devices in 2010. The new version of SYNC Destinations can send turn-by-turn directions to a vehicle by connecting to the car’s in-car navigation system. This is the first app to accomplish this and can be useful for planning out your trip ahead of time. You could set up all of your destinations from the comfort of your home and have them sent to your navigation system as you needed them. The new version of the SYNC Destinations app also takes advantage of several SYNC AppLink features. On SYNC AppLink compatible vehicles, drivers can control the SYNC Destinations app through simple voice commands. These voice commands range from adding new destinations to your route, to getting a traffic report of the area around you. INRIX isn’t the only one taking advantage of the SYNC AppLink voice controls. Ford has also helped NPR in adapting their mobile app so that drivers can browse NPR’s various stations, newscasts, and programs on demand using basic voice controls. 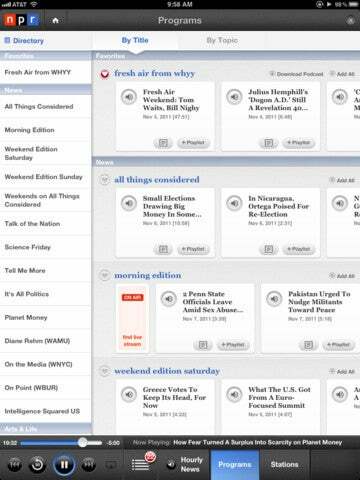 The updated NPR application uses the voice of former NPR newscaster Carl Kasell to help in navigating the app and adds a bit of humor to the experience. Ford is working closely with several app developers in order to expand upon the list of SYNC AppLink compatible apps and aims to provide a better driving experience through the use of mobile applications. The updated NPR app is now available for Android and iOS, while the SYNC Destinations app is currently only available for iOS. Updated version of the Destinations app will be coming to Android and Blackberry devices in the first quarter of 2012.